Beware of the cupakes! Haha! 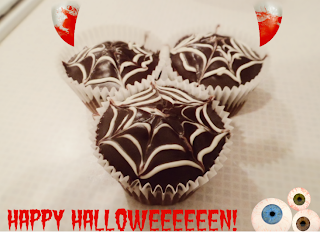 With it being the first Halloween that I've had my blog, I thought that I had to bake something spooky and Halloween related. I ummd and arrd over spider cakes, graveyard traybakes, but settled for these mild but spooky cobweb cupcakes. I have to say, I do rather like Halloween; the dressing up, the baking, the atmosphere but I do with we did it as big as America! Now they really do go to town with all the decorations and parties! I wanted to try a new chocolate cupcake recipe so I searched and found one used for Cookies and Cream cupcakes (Will defiantly be trying those soon!) by The Primrose Bakery. I used the design of of the Spider Web Chocolate Muffins of off the Good Food website and used chocolate ganache to achieve this. Preheat the oven to 190oC /gas mark 5. Line muffin trays with 16 muffin cases. Break the chocolate into equal sized pieces and melt it in a bowl over a saucepan of simmering water, making sure that the bottom of the bowl doesn't touch the water. Leave to cool slightly. In a clean bowl, using a clean whisk, whisk the egg whites to form stiff peaks. Do this before anything else, to avoid having to wash your whisk/beaters. In another bowl, cream together the butter and sugar together until pale and smooth. Slowly add the egg yolks and beat well. Next, add the melted chocolate and beat again. Sift the flour, baking powder and bicarbonate of soda and salt into a separate bowl and stir together. In a jug, stir the vanilla extract into the milk. Gradually add alternate amounts of the milk mixture and flour mixture into the chocolate mixture and beat well between each time.Using a spatula fold the whites into the batter until everything is combined. Spoon the batter into the cases, filling them about two-thirds full. Bake for 20-25 minutes. Leave the cakes in their tins for a few minutes to cool and then transfer them to a cooling rack to cool completely. Break up the chocolate and put into a bowl, along with the cream. Melt together over a pan of simmering water, stirring occasionally to combine them. Once they are fully combined, leave the ganache to cool and thicken slightly. This will make it easier to spread it onto the cupcakes. Once the ganache has thicken, spread some onto the top of the cupcake. Tip: If any cupcakes have peaked whilst cooking, slice off the top and eat it! This will create a smoother finish. To create the cobwebs, melt some white chocolate in a bowl over a pan of simmering water and spoon into a piping bag. Pipe a small circle on top of the cake and then bigger circles around it. Using a toothpick, draw a line from the centre outwards and it will drag some of the chocolate wit hit creating a cobweb. 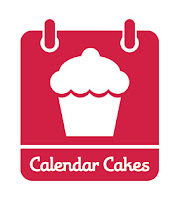 I'm entering this into Dolly Bakes and LauraLovesCakes event- Calendar Cakes!